Skinny Stuffed Parmesan Potatoes are awesome. These delectable potatoes turned out to be some of the BEST I’ve ever eaten! I mean they were mouthwatering, sumptuous, and amazing! In fact, I wanted to eat a whole lot more than I did. But the best thing about this recipe is that it is healthy, low calorie and gluten free. 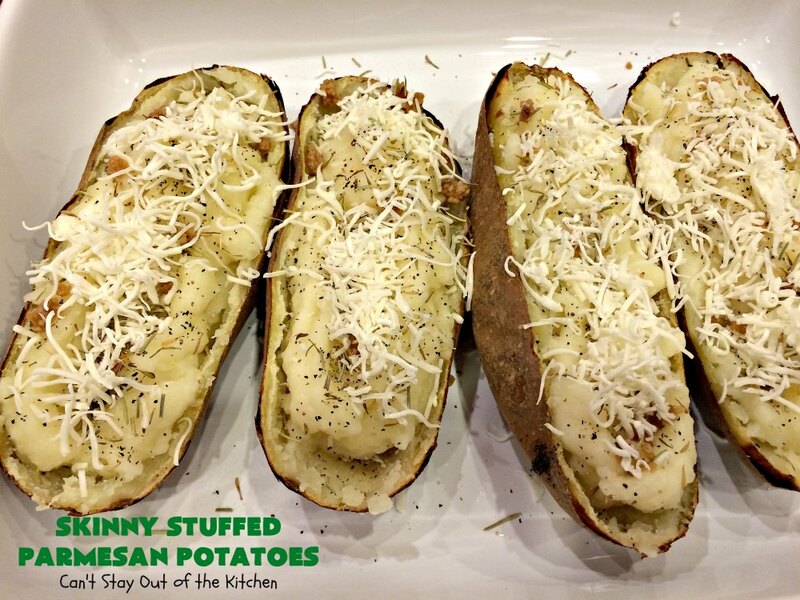 This skinny version of stuffed potatoes rocks! These double stuffed baked potatoes are topped with roasted minced garlic, salt, pepper, thyme and rosemary. A delicious Italian blend of cheese that includes mozzarella, parmesan, asiago, romano, fontina and provolone is sprinkled over top. The cheese blend and herbs are what makes these potatoes so fantastic. 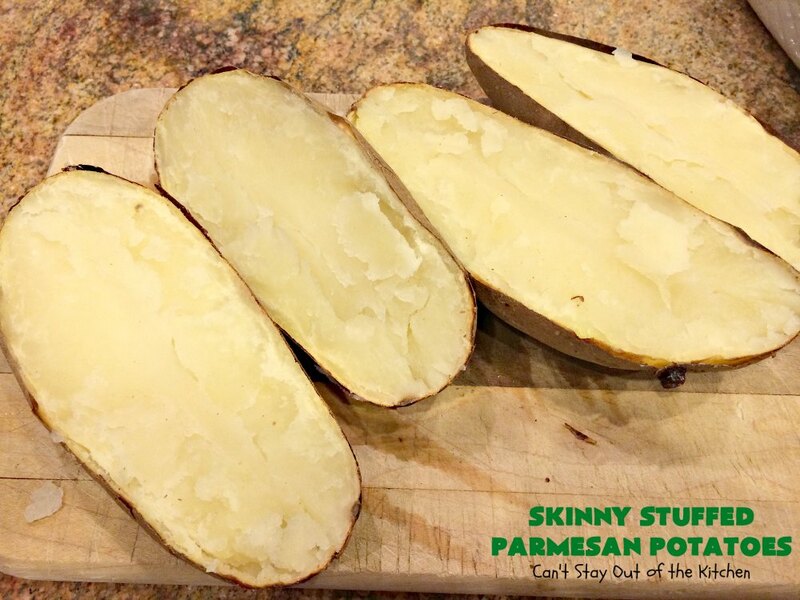 The fontina and provolone cheeses especially add such a delicate and sensational flavor to Skinny Stuffed Parmesan Potatoes. 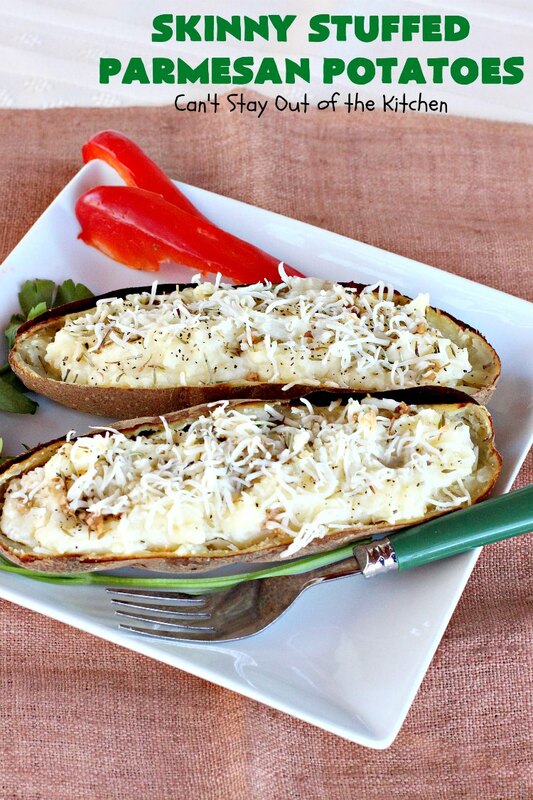 This healthy, lower calorie version of stuffed potatoes has an incredibly fantastic taste. These potatoes just float down your throat and each bite is succulent and spectacular. This is a marvelous side dish to any main dish meal. However, you can also eat this as a meatless main dish. I only baked two extra large russet baking potatoes for this recipe and wished I’d baked about 10! They were THAT good. Using only parmesan cheese is okay for this recipe. But you really need to find an Italian cheese blend that includes all of these cheeses to obtain the same flavorful taste. This is a delicious substitute for LOADED baked potatoes which include bacon, cheese, sour cream or pulled pork. This skinnier version does cut down on the calories quite a bit. While they are not calorie-free, they are wonderful! 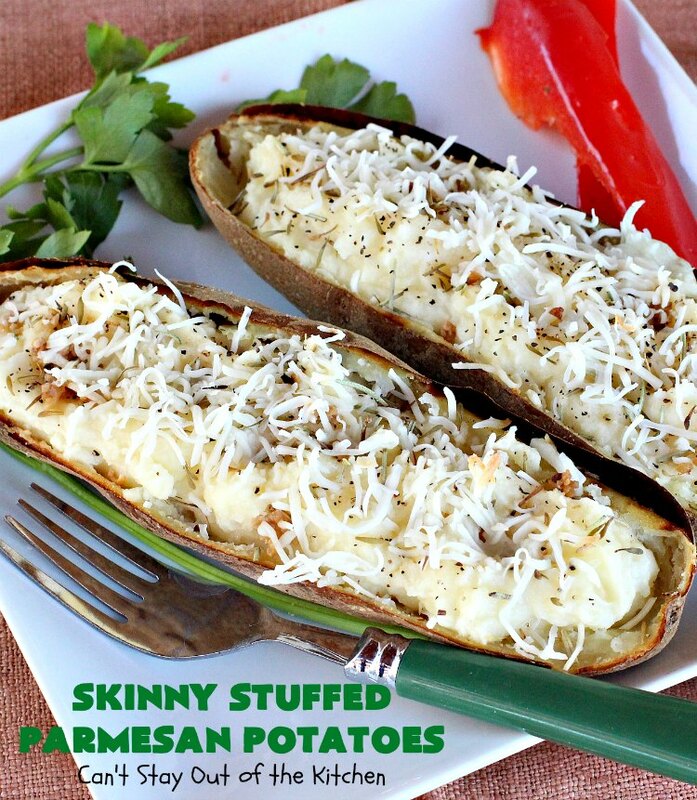 Skinny Stuffed Parmesan Potatoes are one of the best double stuffed recipes I’ve ever eaten. I served Skinny Stuffed Parmesan Potatoes with Baked Parmesan Chicken. I could have eaten all of the potatoes in one sitting by myself–they were so fantastic. Don’t these stuffed potatoes look wonderful? Bake large baking potatoes in a 450 oven for about an hour or until tender. Slice in half. Hollow out potato shells being careful to leave about a 1/8-inch to 1/4-inch border so the potato shells are firm and don’t fall apart when you stuff them. 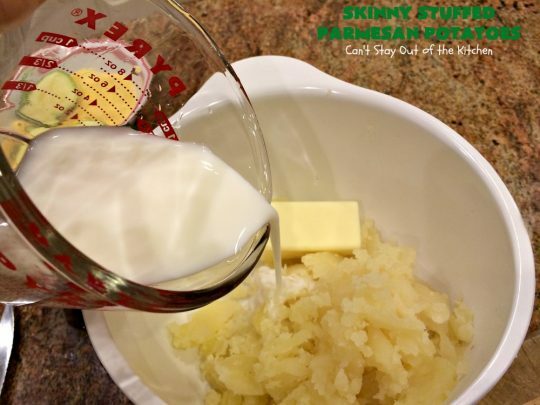 Add 2% milk and 1/4 cup butter to the baked potatoes in a mixing bowl. Mash with a potato masher. These ended up with a very smooth texture even though I didn’t use an electric mixer. Pile the mashed potatoes back into the potato shells. Sprinkle each potato shell with salt, pepper, thyme and rosemary – in the amounts you desire. I used a few pinches over each. Dot each potato with roasted minced garlic. You may have to pat the garlic dry with a paper towel before sprinkling over top of potatoes. 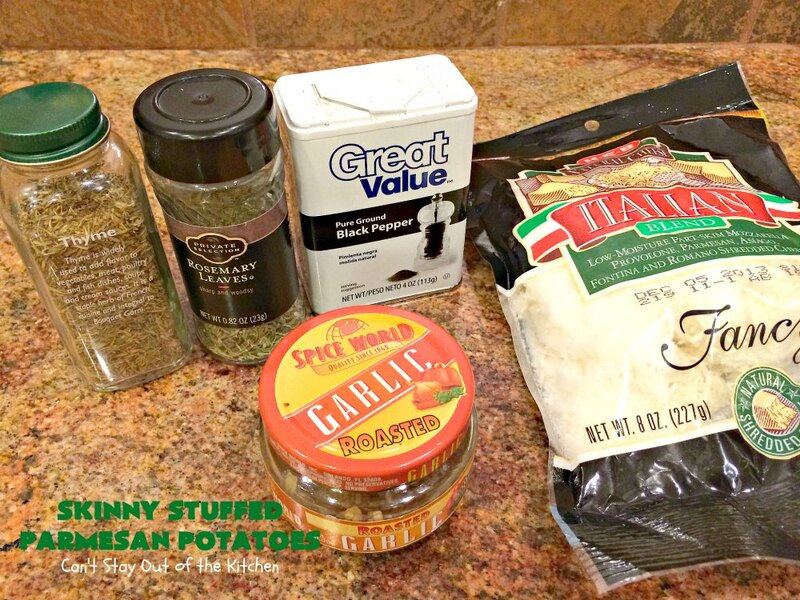 Sprinkle a few tablespoons of Italian cheese blend over each potato. 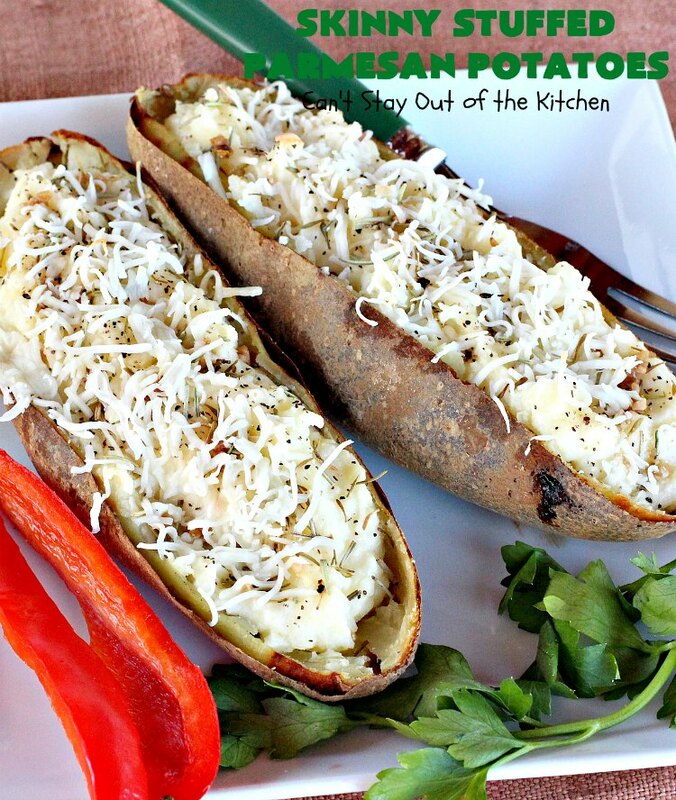 Place potatoes in a glass baking dish and bake at 350 for 8-10 minutes or until cheese melts. Here the potatoes are done and ready to serve. Skinny Stuffed Parmesan Potatoes are so sumptuous and delicious. They go well with any main dish entree. The garlic, cheese blend and seasonings made these potatoes so scrumptious. 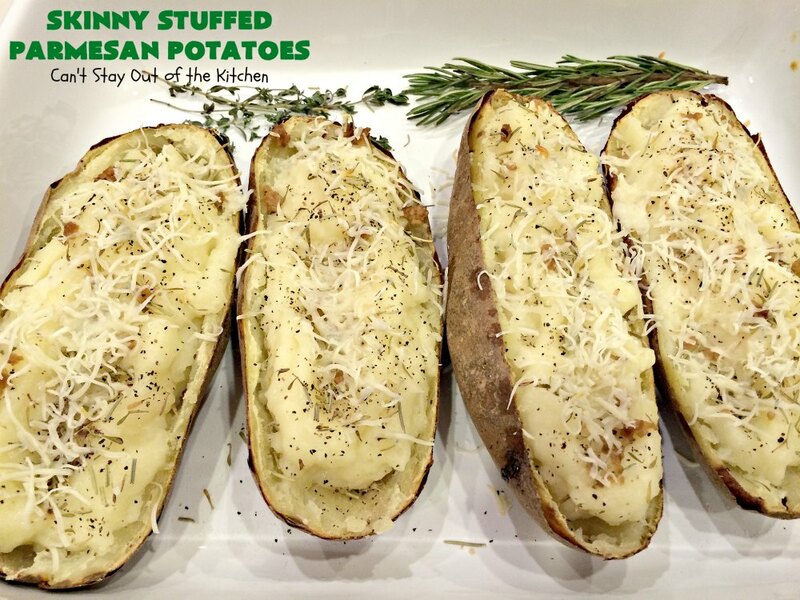 Thyme and rosemary are wonderful seasonings to enhance Skinny Stuffed Parmesan Potatoes. 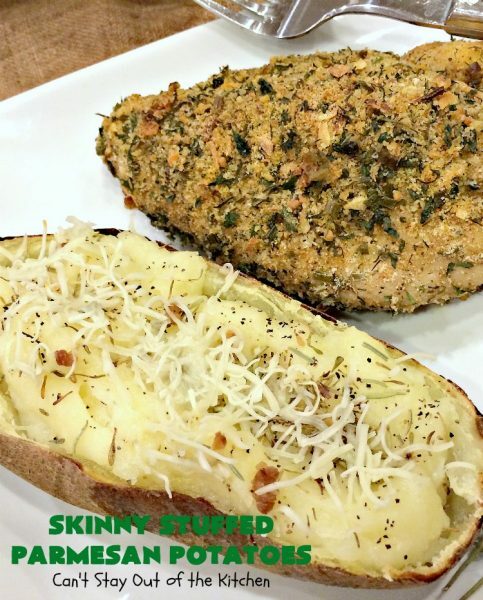 This skinny, low calorie version of double stuffed baked potatoes is topped with roasted minced garlic, salt, pepper, thyme and rosemary. It includes a delicious Italian blend of cheese that adds delicate and sensational flavor. Terrific side dish for company or holidays like Easter or Mother's Day. Low calorie, healthy, gluten free. Wash potatoes and prick a few holes in the potato with the tip of a knife. Bake potatoes at 450° for about 45 minutes to an hour until done. Remove potatoes from oven and slice in half lengthwise. Hollow out potatoes being careful to leave at least a ¼ “ border of potato so the shell will hold together. Place potato shells in a 9x13” baking dish. 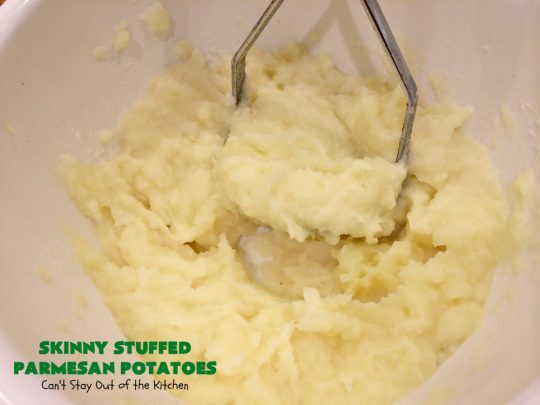 To potatoes, add butter and milk and mash well with a potato masher. Pile potato mixture into hollowed out potato shells. Then sprinkle about a pinch of thyme and rosemary over each potato half. Spread roasted garlic over each of the four potato halves putting a few pieces in different sections over each potato half. Sprinkle Italian Cheese Blend over top of each potato and bake at 350° for about 5-10 minutes until cheese melts. 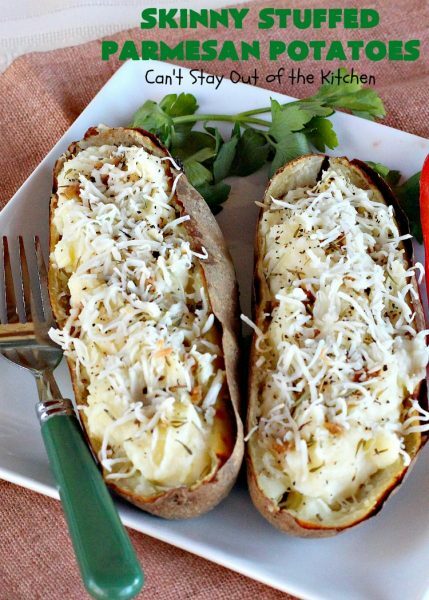 This skinny, low calorie version of double stuffed baked potatoes is topped with roasted minced garlic, salt, pepper, thyme and rosemary and then I added a delicious Italian blend of cheese that includes mozzarella, parmesan, asiago, romano, fontina and provolone. The fontina and provolone cheeses especially add such a delicate and sensational flavor to the potatoes. Low calorie, healthy, gluten free. 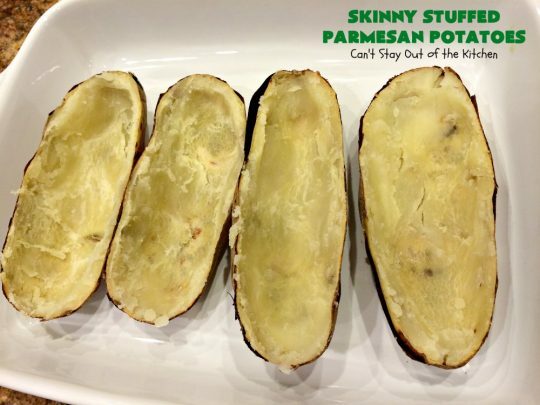 Place potato shells in a 9×13” baking dish. 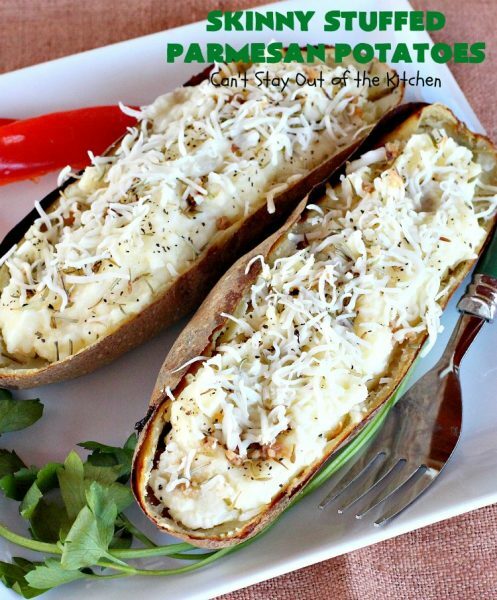 Even picky eaters including children will love Skinny Stuffed Parmesan Potatoes. These terrific potatoes are healthy, lower calorie than many stuffed potato recipes, and gluten free. 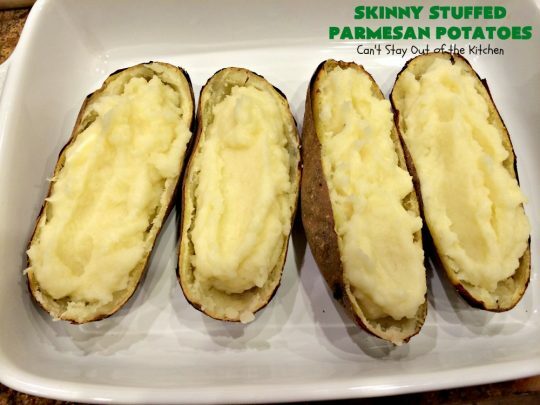 We savored every bite of Skinny Stuffed Parmesan Potatoes. Perhaps you’d enjoy a serving, too? Sorry, I missed how these were “Skinny” 1/2 cup of butter and 1 cup of cheese plus milk and potato??? Sounds awesome, but not skinny! I never use whole milk in a recipe unless I specify I’m using whole milk. I generally use 2%. 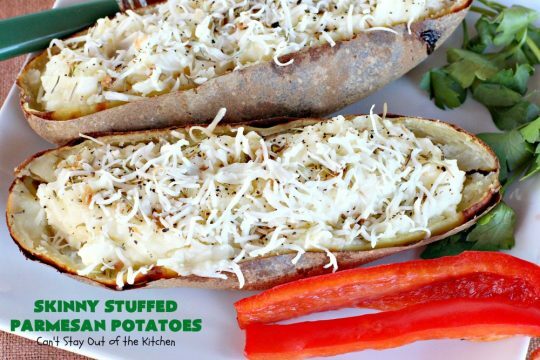 Most stuffed potato recipes are filled with bacon, cheddar cheese, cream cheese, sour cream and other ingredients. While all delicious, they are much higher in calories than this recipe is. You can make these delicious potatoes even skinnier by cutting back on the butter and using less Italian cheese blend. Thanks for stopping by. These look really good! I love potatoes so much. What more could you want than potatoes with cheese and butter? Thanks for sharing, Teresa! They were awesome, Shari! The flavors turned out so marvelously.